Hear ye, hear ye! We’ve got our first couple of early acceptances for issue 6 of The Quilliad for you today. We’ll be publishing an eerie flash fiction piece about the weather by Nicole Brewer (a writer, editor, and micro-press publisher in Toronto who’s part of the parenthetical team) called “The Worm Will Eat the Bird” and a quirky science fiction piece about a “nomadic Anne Hathaway lookalike android” entitled “Fanatics Inherit the Earth. Cheap Motels Last” by Alexandra Harrison (an Albertan writer and editor whose work has been published in various journals and anthologies). If these sound interesting to you, consider supporting our Kickstarter. In addition to getting to read these excellent pieces, we have a variety of other rewards available, including art, poetry, and custom-designed chapbooks. Our campaign is at 47% with 11 days to go. If you haven’t received a reply from us, that just means we have yet to decide! Also, for those Canadian writers and artists who haven’t sent us their work yet, you still have time. Check out our submission call for details. 15 Days Left of Our Submission Call & Kickstarter! Send us 1-5 pieces. We pay $12 per contributor plus a contributor copy and the opportunity to feature at our launch party. As for our Kickstarter, we’re at 46% as of this afternoon! 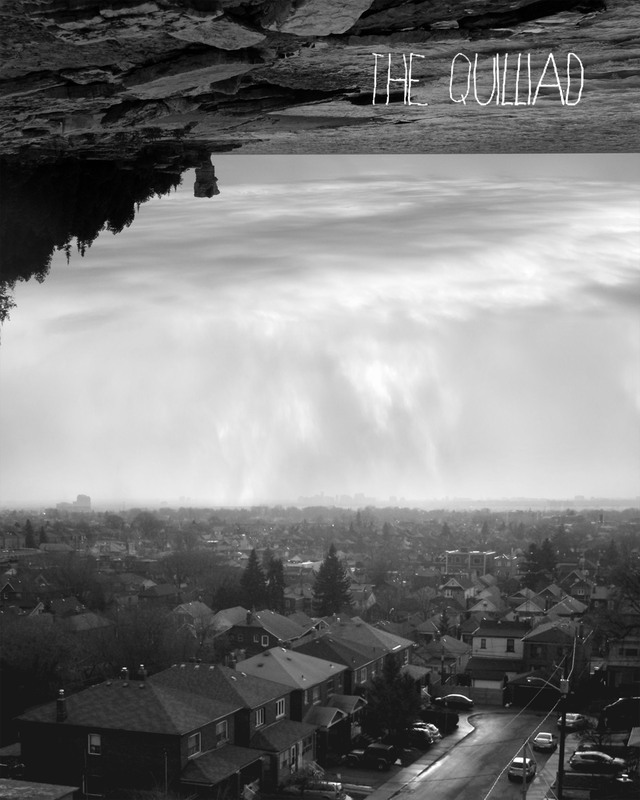 We’re raising money to pay for The Quilliad: Issue 6, The Quilliad Press’s first line of chapbooks, and our future as a press. 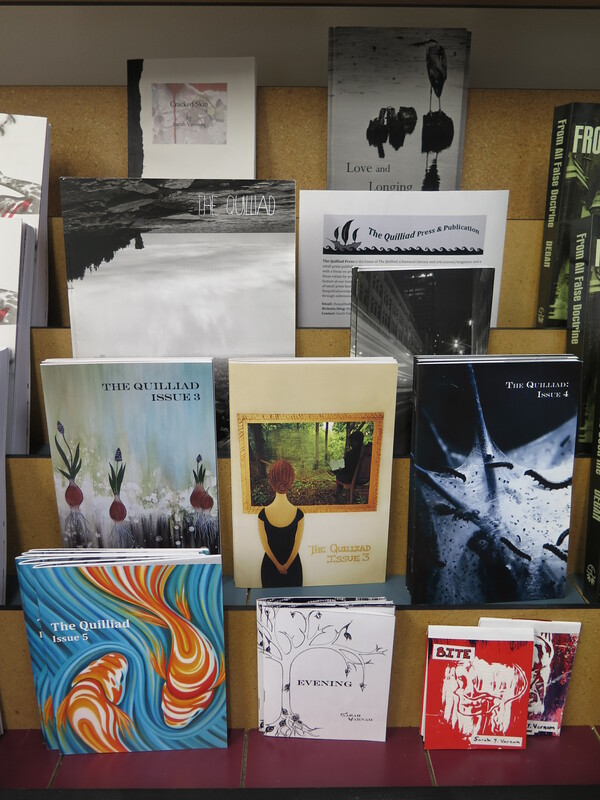 We’re a small press publisher committed to publishing and promoting work by emerging and established Canadian creators. In addition to our publishing projects, we also write profiles of local artists and their projects, review small press books, cover local arts and literary events, and post about our poetry parrot-in-residence. And we have plenty of rewards for backers. We’re offering poetry on demand, art prints, copies of The Quilliad and our future chapbooks, and work by our talented staff members, all of whom are published writers. If you’re interested in supporting the arts, small press publishing, new writers and artists, and/or Canadian culture, check out our Kickstarter: www.kickstarter.com/projects/1765917797/the-quilliad-press-and-issue-6. We’ve been busy lately. We’ve been writing book reviews, delivering copies of The Quilliad to local zine libraries, and stocking the shelves at Artarium with our publications. And now we’re launching our submission call and Kickstarter campaign concurrently. This is an exciting time for us. We’re publishing under our new small press publishing company, The Quilliad Press, and we’re contemplating our first run of chapbooks. We’re also looking for submissions for The Quilliad: Issue 6, our second annual Halloween issue. We’re open to things that aren’t on this list as well; query us if you aren’t sure. Email your submissions (1-5 pieces) to thequilliad@gmail.com before midnight on October 20. We will be paying a $12 honorarium plus a contributor copy to every writer or artist we publish, and all contributors will be invited to feature their work at our launch party on October 29 at Betty’s on King in Toronto. This new official status as a small press publisher reflects our commitment to growth. The Quilliad Press will continue the work we have been doing, but we are increasing the number of reviews and artist profiles we post, and we want to push beyond our biannual journal publication to chapbooks and, hopefully, anthologies. We have successfully funded The Quilliad‘s previous issues through crowdfunding, revenues from launches, and money out of our own pockets. Now that we have seen the potential of this publication and can imagine the future of our recently formed small press, we want to move beyond an issue-to-issue model to one that is more self-sustaining. Which is why we want this Kickstarter to be our last. Any support means a lot to us, our contributors, and our readers, whether you pledge $5 or $100, and will have tangible results that affect people across Canada, North America as a whole, and beyond. We’re offering copies of The Quilliad, The Quilliad Press’s first chapbook, and our own published work, as well as art prints, haiku and glosas on demand, and even personalised books of poetry and art with a limited print run of one as rewards for our backers. 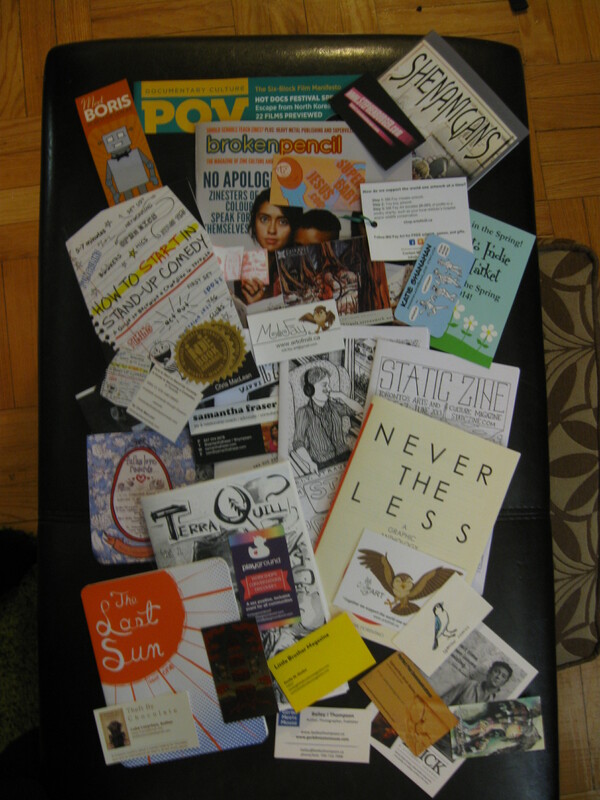 Backing The Quilliad Press is a way to directly support small press publishing, as well as the dozens of Canadian writers and artists who we publish and promote. For more information about our Kickstarter, visit https://www.kickstarter.com/projects/1765917797/the-quilliad-press-and-issue-6. Many apologies to anyone who was waiting for this to be posted–when the editor-in-chief gets sick, things get delayed. We’re also working on a Kickstarter campaign so we can pay you more for your work, so we’re pretty busy. You can submit your poetry, (short) short stories, and even photography and visual art (as .jpegs) this time around! Please see https://thequilliad.wordpress.com/submissions/ for submission guidelines. The submission deadline is March 31. No submissions will be accepted for this reading period after that date. A note: we are currently only accepting submissions from people living in Canada. 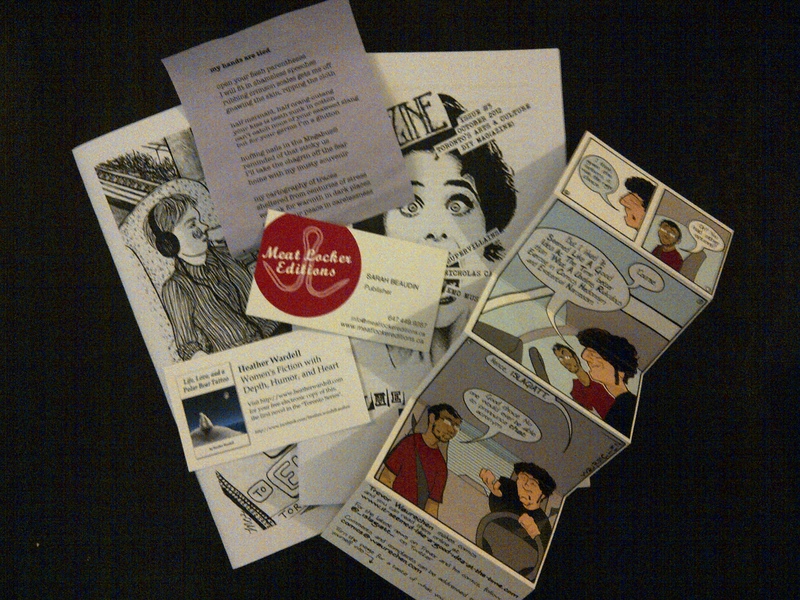 The Quilliad will be at the Toronto Indie Arts Market Small Press & Literary Festival on December 14th at the Gladstone Hotel in Toronto, from 10:30 a.m. to 4:30 p.m. Come out and enjoy the literature with us!